Property 11: Brand new for 6 in Grace! Property 15: A cozy and bright apartment in the historical center! 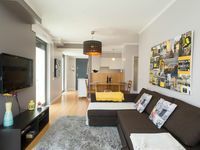 Property 17: Renovated apartment in the charm of old Lisbon. Perfect location. Property 47: Alfama - Very bright and welcoming apartment with a beautiful Tagus view. This apartment is very spacious and modern and comes equipped with all the necessities you need. Although, we did not meet the host personally she was only a text message away. The location was perfect. From the balcony you have views of Santa Justa elevator and S&atilde;o Jorge Castle. A bakery and a restaurant are located right at your front door. The address is very easy if you intend on using Uber for distances and if not the metro and teams are near. Overall, it was a wonderful stay in Lisbon and the apartment was perfect. Would highly recommend this apartment. It is in a great location. Excellent area for sight seeing. Close to a local market, restaurants, shops and public transportation. It is very clean and modern and it has all the amenities needed. Excellent apartment!